. 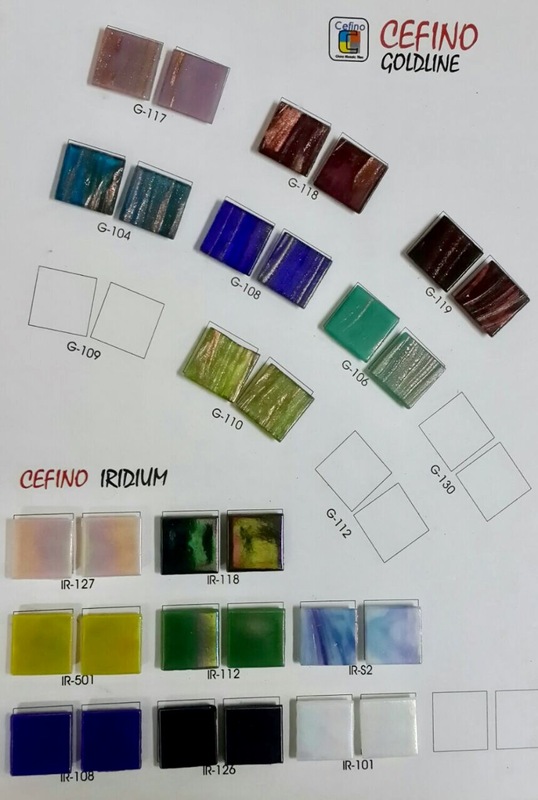 Cefino imports vitreous glass tiles from China in size 20×20 mm, and manufactures ceramic tiles in size 1×1” in its factory located in Noida.
. The company sells tiles to retailers as also makes mosaics using whole tiles with the help of proprietary design software.
. It gets the imported tiles pre-stuck on sheets in single colours that it uses to create newer sheets with randomly mixed tiles or popular colour combinations for retail sales. 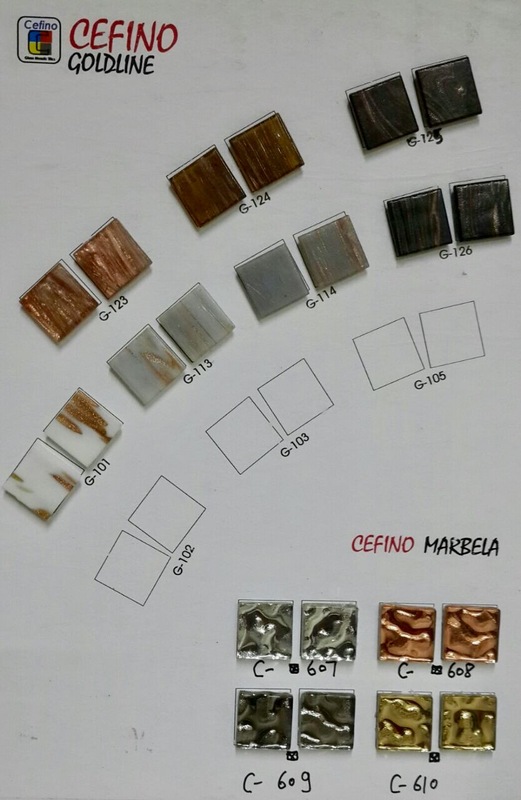 As mosaicists, I mentioned, that we’ll be interested mostly in single colour sheets.
. Cefino‘s manufacturing unit is in Noida, tile stocks are kept in Neb Sarai near IGNOU in New Delhi, and a small office is located in Malviya Nagar, New Delhi. The stocks can be seen only in Neb Sarai but at some notice the requested tiles can be sent over for the purchaser to the office in Malviya Nagar.
. 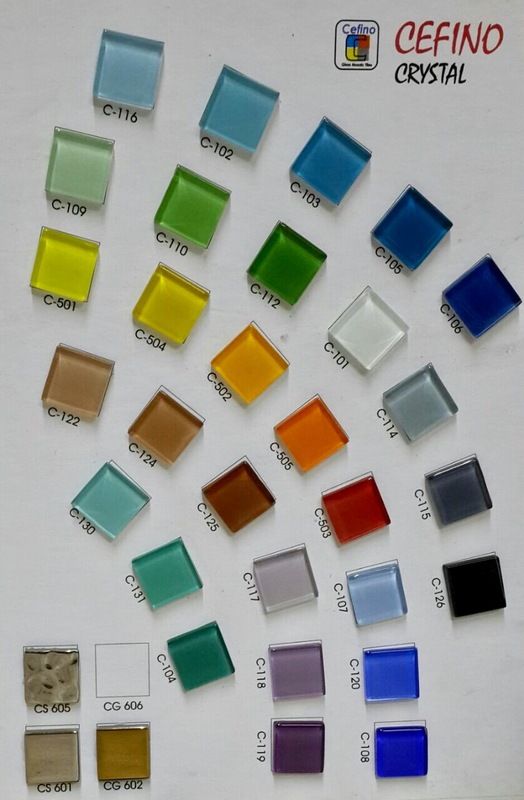 Presently, the Classic range includes only the grainy variety of vitreous glass tiles.
. These prices are MRP as of October 2016 and may go through changes. To the extent possible, Cefino will offer some discount on their MRP figures.
. Those located in NCR can request tiles from the company’s Sales Executive through Whatsapp by quoting the tile codes and quantities. They should include their address and mobile number in the message and fix up the specifics on stocks and delivery time through a phone call. When in stock, tiles can be made available at Malviya Nagar in 2 days after a prior request. One can go pick them up.
. Those in NCR have the choice of requesting the door delivery of tiles as long as the delivery person’s commute charges are reimbursed by the purchaser. When available, tiles will be sent over within 3 days to most locations in NCR.
. Cefino can sell a minimum of 1 sqft per colour of tiles.
. Outstation deliveries of tiles are also possible if the courier charges are paid in advance. Further details can be taken from the company. 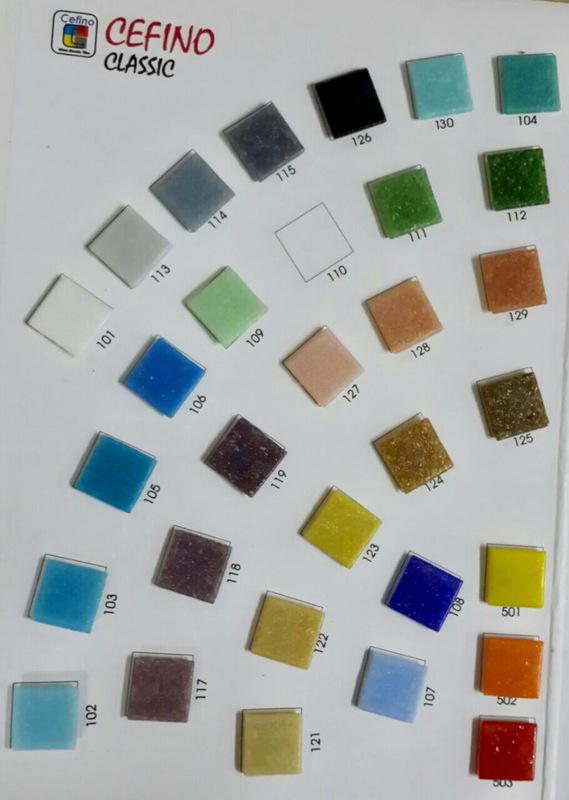 With this supplier, mosaic-makers based in India can order vitreous glass tiles in small quantities from 2 different sources. If you know of any more, do let me know.